The STAR WARS: IMPERIAL ASSAULT World Championships were a blast to host. This was our largest tournament yet and ended with a hard-fought Top 16 on Sunday. Thank you to everyone who made the first year of Skirmish so enjoyable, and congratulations to the 2015 World Champion, Martin Hoffmann! 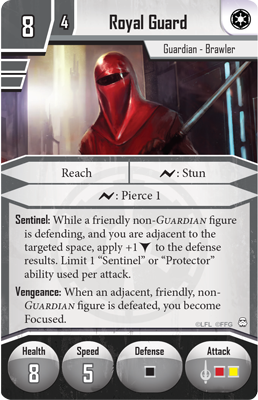 While the influx of new figures and cards contributed to varied lists competing at the top level, it was clear that the tournament metagame revolved around two well-defined archetypes: Royal Guard swarm with Imperial Officers and Rebel Saboteur-backed Rebels. We have been watching the figures in these armies carefully and have come to the conclusion that some of these figures are simply more powerful than the alternatives and their presence inhibits the growth of a healthy metagame. To ensure a diverse and interactive second year of Skirmish, it has become necessary to exercise errata. Imperial Officers have been the target of great scrutiny. Order has proven more powerful in Skirmish than in the Campaign. Extending the threat of unactivated figures across the map in the first round has led to somewhat one-sided games and player frustration. Because of this, regular Imperial Officers are being modified to reflect the different needs of each game mode. Order now gives a move action in Campaign, but only two movement points in Skirmish. Movement points are still an advantage, but it is now much harder to extend unactivated figures and sprint across the map to uncontested objectives in Skirmish. The Imperial faction retains its signature positioning ability, but at a more balanced rate. Elite Imperial Officers remain unaltered due to the significant cost increase over the regular version. The Royal Guards have over-performed throughout the first year of Skirmish. They were intended to act as defensive support figures, but they have been consistently and effectively played in multiples as all-purpose fighters. We are removing the incentives to play self-supported groups of Royal Guards, as well as reducing the offensive capabilities of the regular version. Surge for +2 Damage has been replaced with Surge for Pierce 1 (regular only). With good attack dice and a high probability of rolling at least one surge, regular Royal Guards had an amazing attack to match their great defensive stats. This change rebalances the offense and better accounts for the additional damage from Vengeance. The unrestricted Protector encouraged Royal Guards to clump together for maximum effect. This is both thematically and mechanically unhealthy in the Skirmish and Campaign games. The non-Guardian restriction on Sentinel requires Royal Guards to behave as Guardians, rather than as an elite strike force unto themselves. Vengeance and Forward Vengeance now only trigger on non-Guardian friendly figures. Like Protector, Vengeance and Forward Vengeance encouraged the linear Royal Guard swarm. This change discourages that strategy, but does not overly penalize armies that use Royal Guards as defensive support figures. Saboteurs have been instrumental in countering Royal Guards, but their high-powered offense has proven to be too flexible. The Pierce and Stun abilities have made high-cost single figures like Darth Vader and the AT-ST a liability. Within the same figure group, Blast can wipe out entire squads of Stormtroopers. Rebel Saboteurs are being modified to remove some of this flexibility. Regular Rebel Saboteurs: Surge for Pierce 2 replaced with Surge for Pierce 1. Pierce 2, especially when combined with Overload, is extremely strong against single figures. The regular Saboteur’s cost does not fully account for the value of this ability. Regular Rebel Saboteurs: Speed 5 reduced to Speed 4. Additional speed is a great ability. In this case, the regular Saboteurs are fairly costed for their combat potential, and Speed 4 is sufficient for getting them into the fray. 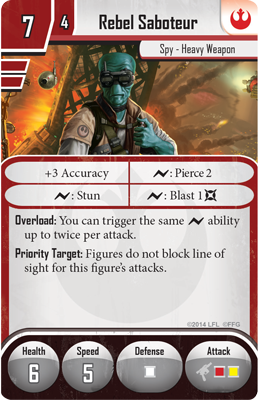 Elite Rebel Saboteurs: Surge for Blast 2 replaced with Surge for Blast 1. Blast 2 is a devastating ability, and the not-uncommon Blast 4 can be game-ending. This uncontested damage has led to artificially fast and non-interactive games and is a contributing factor in the prevalence of mid-cost swarms like Royal Guards. January 1st, 2016. The Ord Mantell Junkyard map is rotating out. Joining the Kuat Space Station and Mos Eisley Cantina is the Training Ground map from the Stormtrooper Villain Pack. These changes to the Imperial Officer, Royal Guards, and Rebel Saboteurs will help level the playing field and invite new strategies to tournament games of STAR WARS: IMPERIAL ASSAULT Skirmish. We will continue to monitor the health of the game and we believe that many upcoming figures and cards will address any lingering concerns. Thank you again to all of the STAR WARS: IMPERIAL ASSAULT players out there! We are excited to show you what we’ve been working on in 2016!